Over the years I have seen more than a few archers with the word “Relax” plastered on their bow, obviously intended to help them do so. Those I have spoken to about it share impressive techniques for managing what’s referred to as “the mental game” in archery; managing the things that one thinks about while shooting. Experts and other authors often write about the mental game as if it’s the only thing one needs to work on. Many people who take my beginner class express surprise that archery is relaxing – “It’s like yoga with a weapon!” Some make the connection to how often I coach them on how to relax in specific aspects of their form and technique, others just ackowledge the phenomenon. In this post I’m going to get specific and practical about relaxation – I will share with you what I call “The Magic 7 Relaxation Points.” Mental game relaxation and other skills like visualization will be addressed in future posts. As you approach your shooting position (the shooting line, a stake on a field course, etc. ), approach it as if you are walking up to a friend you’re really happy to see. Your step should be light, and there should be a playful eagerness to your stride. Stand on your mark as if you belong there and there is no place you would rather be at that moment. Calm the pace of your breathing, and “center” yourself, as you get ready to start your shot sequence. Now here is the important part: get in your T-shape with the bow arm extended, mock anchor on your face, and let your posture losely “drop” or settle into place – square up at the target. Are you “pointing” directly at the target in a “loose as a goose” manner? If not, you will use muscles in your arms and/or possibly your hips to aim yourself at the target at some stage in your shot setup. Great. However, upon release your body will “snap back” to the direction it is naturally aimed at, and this will most likely happen before the arrow has completely left the bow, resulting in a right or left miss. If you watch professional baseball or football you often hear the analysts comment about an athlete “throwing across his body” – this is the same thing. Moving your bow arm independently up, down, left, or right to achieve your aiming goal or desired sight picture is a bad thing to do. It is the equivalent of collapsing your shot. Collapsing your shot means not pulling through the shot or achieving a consistent draw length; it also results in a poor release. Because you reduce your draw length a bit, sometimes a lot, the result is a major change in your equipment tune; your arrows are now too stiff. So, any aiming adjustments you need to make left or right are best achieved with proper target orientation as mentioned above. Small left/right adjustments can be made by slightly swivelling from your hips, but not too much. Adjustments for shooting at an uphill or downhill target, or targets closer/farther than your “point on” distance should also be made from the hips: you should maintain your T-shape and simply allow yourself to “tip” forward or backward from the hips as if your upper and lower body were on a “hinge.” These proper adjustments require a relaxed hip/waist. Every “how to” book that I’ve ever read about archery, whether Olympic, Barebow, Compound, etc. emphasizes the importance of a relaxed grip on the bow (we won’t get into “high” v. “low” grip in this post). Olympic and Compound archers strive for the heaviest possible bow mass weight they can handle and they essentially let the bow “float” in their hand. Most of these archers also use some sort of wrist or finger sling. In addition to sometimes literally keeping the bow from falling out of their hands, the sling sends a subconscious message to the brain that the bow will not fall out of their hand, even if the actual potential for that does not exist. Most people who shoot a lighter mass weight bow (e.g. 2LBS or less) find they need to grip the bow a little tighter. I have personally found that a non-modern “stick” style longbow requires a rather firm grip. In the end, you want the most relaxed grip your equipment choice will allow – a “death grip” or “choking” the bow results in undesired bow arm tension and bow torque, and travels all the way “down the line” or through your entire draw/aim/release unit (wrist-forearm-elbow-triceps-shoulder, etc., etc.). For some reason tensing the shoulders is one of the first bad habits an archer develops and one of the most pervasive needing focus and attention throughout an archers participation in the sport. To the observer, the shoulders “rise” toward the ears – I’ve seen some archers whose draw side ear actually touches their shoulder! The best way to avoid this is to consciously confirm that your shoulders are relaxed as you start your shot sequence. There are too many shot sequence systems around to suggest exactly when one should do this (during the draw, before you anchor, etc.). But you absolutely should focus on this if it is a problem for you. Tense shoulders have direct a cause and effect realtionship to just about every possible form flaw – bow torque, plucking, collapsing, etc. Your neck is the part of your body from which you achieve consistent and proper head position. I’ve found most archers have a problem with this aspect of body awareness, beginning or advanced. You need a coach or other outside oberver to video tape you so you can see what you are doing. Shooting in front of a mirror can work too. Where you settle your head in order to establish your desired sight picture is very personal. I do not believe there is any one right or wrong position. It simply must be effective, easily & subconsciously achieved and consistent from one shot to the next. Think of it this way. Your anchor and head position are equivalent to the rear sight on a rifle. If that sight was loose, not attached properly, and flopping around you’d never hit anything – at least not consistently. Your neck needs to be relaxed thus enabling you to settle into your consistent and effective head position. Think of that scary wobbly neck that newborn children have – I’ve always referred to that as a melon on a rubber band. Well maybe your neck shouldn’t be that loose, but almost. This is where archery gets comical. There are all sorts of opinions out there about shooting with both eyes open or with one eye closed. It depends on the archer, the style of shooting, and eye dominance. How one processes the visual information presented by the target is very personal from a neurological, psychological, and physical perspective. I’ll leave it at that. My only rule with people I teach and coach is this. If you decide to close an eye to help you aim, great. But, if closing that eye causes you to tense your face up, that facial tension is going to travel from your face to, you guessed it, your neck, your shoulders, etc. etc. It’s really fun to see how distorted people’s faces get when they decide they must close an eye to aim best. It’s also a funny moment when people forget about eye dominance and close the wrong eye – and shoot a perfect bull’s eye, on the target in the lane next to them! I recently read that a steady (not tense) bow arm is more important than a good release, and will actually help minimize the negative effects of a bad release. I don’t know if that’s true, but I DO know that I have observed lots of bad shots that were a direct result of a pluck or other bad release. I’ve also seen LOTS of people manufacture a release follow through because they (think they) know their release hand should dramatically fly backward with an impressive looking flourish. They have improperly convinced themselves that the felt backward motion of that draw arm is “good feedback” about their release. I get it – it’s something concrete that you can feel and others can observe telling you and the world that you are doing it right, and, it looks cool. I’ve also seen archers manufacture forward bow roll – they use muscles in their hand/wrist to make the bow roll forward upon release. To recap so far on this point: archers sometimes use muscles to force a dynamic follow through or forward bow roll – using muscles creates tension, the opposite of relaxation, and this is bad. I like the Zen teaching for a proper release the best. Imagine a branch on a tree collecting snow. At some point the weight of the snow becomes too substantial and the tree branch “gives way” to the weight and the snow falls off. This is a great analogy for an archery release. The bow arm is extended and steady, pushing forward in many systems, and you continue to pull through the shot (using back muscles and upper body chest expansion). As you continue this slow steady push/pull you relax your string fingers and allow the string to pull through your now loose fingers; you do not use muscles to open your fingers (that’s plucking), you relax them and let all that stored energy in the string from the drawn bow do the work. 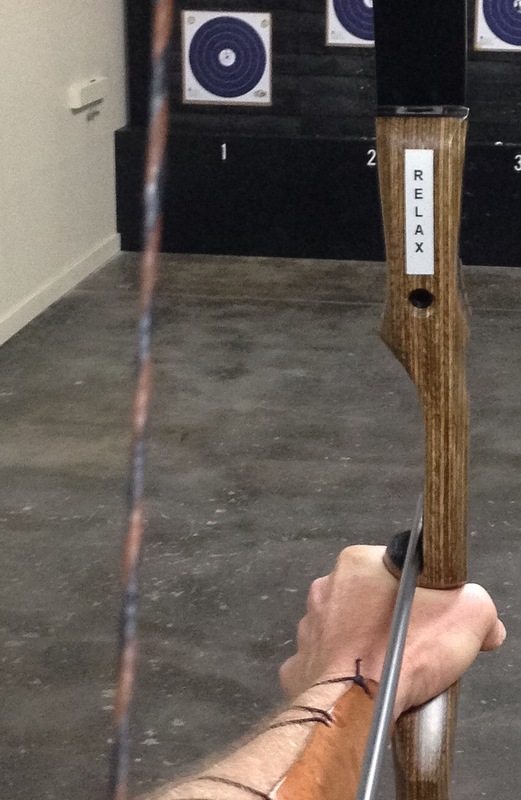 Depending on the amount of draw weight in your bow, your release hand, if relaxed, will most likely experience a bit of recoil or backward motion across your face; it may also have very little or no backward motion, what some call a “dead release.” In my opinion there is nothing wrong whatsoever with a dead release; it is certainly preferable to a pluck! Going back to my earlier comment about a manufactured release follow through: I’ve done video analysis on many archers which shows that the manufactured release follow through results in a bow arm that significantly pushes to the left (for a right handed archer). The release looks cool and impressive, but the shot misses left. Then the archer adjusts the windage on her or his sight, and the cycle begins . . .
Oh no, how do I fix this?!!! Two terms: Blank Bale Practice and Process Goals. If you are serious about improving your archery skills how and how often you practice becomes really important. You need to do more than shoot lots of arrows at a target trying to hit bull’s eyes once a week (or less) – very few of us are naturally skilled enough to get away with that. Most of the best archers I know shoot “1,000 arrows a week” or “6 hours a week,” etc. But what they do when they shoot that much is what matters. Shooting at a blank bale from close distance (10-20 feet) allows you to focus on form and technique. 10 – 20 feet eliminates as much as possible the compulsion to try and hit something specific. I say “as much as possible” because trying to aim at and hit something seems to be hard to resist – most archers I talk to say it’s really hard not to try and hit that little spot on the bale, or create a pattern (like a 4 point cross). Something happens to the brain when we put a projectile in our hands – when we try to trick the brain by taking away that target with a bull’s eye that is begging to be hit, the brain seems to create one for us. Do your best. Shoot arrows that you don’t care about because you’ll most likely break nocks, tear fletching, even robin hood a shaft or too (cool, but expensive). Shoot no more than 3 arrows at a time and really FOCUS on one aspect of your form relaxation at a time.